The Scientific Method | Why Dont You Blog? This entry was posted in Science, Society and tagged Belief, Creationism, Evidence, Evolution, Faith, FSTDT, Logic, Pictures, Religion, Science, scientific-method, Society by ATGW. Bookmark the permalink. As much as I loath creationism. 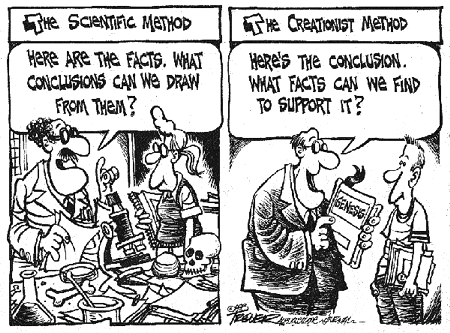 I feel this comic was rather ironic in it’s portrayal of the scientific method. As far as I was aware, the scientific method involved creating a hypothesis, and then devising experimental studies to test the validity of that hypothesis. Trying to derive a model based on data has massive problems. Remember, McCain does a lot of things right and is a great heroic war veteran who genuinely puts his country first, but Creationism is one key area where he is completely wrong and could potentially create a major setback for American students and businesses. We can’t let America fall behind foriegn countries in the departments of Science and Technology because of his superstitious beliefs.